I don't have a problem, per se, with Jonathan Carroll. Indeed, I've long enjoyed hoarding his novels with a view to drip-feeding them into my life as and when the whim takes me. I have fond memories of The Land of Laughs, and even though, in parts, Bones Of The Moon annoyed me, I was uplifted and happy to have read it. 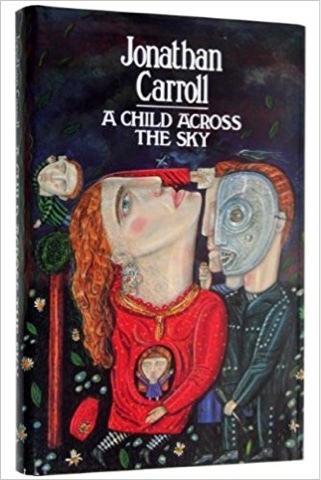 A Child Across The Sky returns us to Bones... characters Cullen and Weber once more, this time related from the point of view of the former film director and latterly the director of a theatre company of terminal cancer patients in New York, Weber Gregston. His best friend and occasional collaborator, Philip Strayhorn has killed himself, in unusual circumstances, leaving behind him a legacy of horror movies, magical video tapes and an angel named Pinslepe, who may or may not be the angel of death and is also pregnant with Strayhorn's ex-partner Sasha, who in turn is pregnant with her and also with cancer. Carroll has never felt the need to explain things, particularly when it comes to causality, and often only does so obliquely when he so chooses. He addresses complex, adult themes with a kind of whimsy that occasionally grates, and he could be accused of childishness, using children and animals as avatars or metaphors or angels of death, and anything-can-happen as a plot device, expecting the reader to faithfully accept the facts of the action without question. We're expected to believe Strayhorn is in the afterlife carefully directing the action (when it transpires he couldn't do anything as a writer/director except steal Weber's ideas in the first place), helped by Pinslepe, a pregnant child-angel, who prevaricates with Weber and in places outright disagrees with what Strayhorn says in his intermittent narrations, which he later admits were not one hundred percent honest. What it boils down to is that Strayhorn has birthed an evil by creating his last Midnight horror film, and he tries to convince Weber (and the reader) that only he can correct this by the shaping of something of beauty out of the final cut of his as yet unreleased final movie. I feel I might be misrepresenting the book, and I know that dedicated fans will take issue with my opinion, but it all feels like rather a mess. I was quickly fed-up with the unreality of the main characters, both in how they react to patent absurdity and their relationships with each other. I was underwhelmed by the climax and resolution, and I was disappointed with the plot, the introduction of characters who mean nothing to the story (sorry, Blow Dry), and the intrusion of Strayhorn into the structure of the novel. 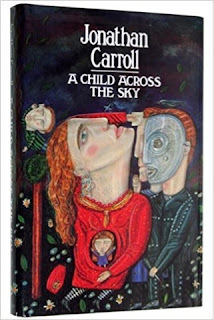 In my opinion, this is the weakest of Carroll's books I have read to date, and the next one might have just dropped a few places on the To-Read list.